The new generation of TowerRAID Plus TR4UT-BP / TR4UTP and TR5UT-BP / TR5UTP are equipped with SuperSpeed USB 3.0 that provides 5Gbps of total bandwidth for instant performance upgrade. 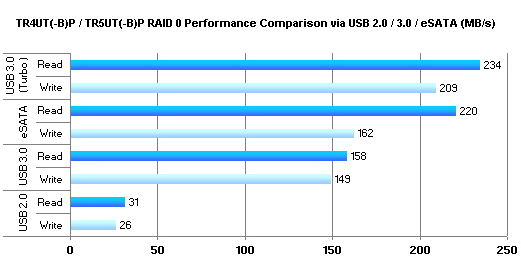 SuperSpeed USB 3.0 5Gbps bandwidth increases performance by 10x over USB 2.0, allowing TowerRAID Plus to perform over 200MB/s in read speed using USB 3.0 vsus 20MB/s using USB 2.0. The complimentary Windows TurboHDD software turbo charges the USB 3.0 performance to over 200MB/s in read speed. To maximize the performance using the eSATA port, both models are bundled with 2-port 6G eSATA PCIe 2.0 x1 controller cards (HA-SAN-RR622). This controller card supports Windows, Linux and Mac, providing connectivity when eSATA port is unavailable. The 500MB/s bandwidth of the 6G eSATA PCIe 2.0 x1 provides the TR4UT-BP / TR4UTP and TR5UT-BP / TR5UTP over 200MB/s in performance via eSATA interface. Hardware RAID engines are embedded to lower the host server/computer's CPU utilization reserved for other tasks, leaving the complex RAID calculations to the dedicated hardware RAID engine embedded on the TowerRAID Plus. Since RAID is included in the hardware of the enclosure, there is no operating system compatibility issues. Windows, MAC and Linux operating systems will see the unit as a single large storage volume with RAID protection against hard drives failures. To increase protection, each RAID configuration is stored in both unit and the RAID controller card. In case of a hard drive and controller failure, RAID configuration is preserved allowing the administrator to move the complete RAID set to another system without loosing RAID configuration and most importantly, the data inside the RAID set. An optional RAID monitoring software provides crucial real-time information of the system. Real time system and RAID status is also provided in an intuitive graphical user interface. Critical alerts such as failed drives or degraded RAID arrays could be send via SMTP e-mail.